The first week of June means new stuff at Apex Magazine! This month’s Apex Magazine has a bragworthy table of contents. Fiction by Aimee Ogden, Tobias Buckell, Mary Turzillo, Maureen McHugh and more, and non-fiction essays and reviews from Karen Lord, Mary Turzillo, and A.C. Wise. You’ll need to check back on their website later in the month to see everything that’s being released for free, but right now, you can read the fantastic short story “Elena’s Angel”, by Aimee Ogden, and you can also read the interview I did with her. But I want to turn this into a discussion. Go read Ogden’s story. Or if you don’t have time, just read the Interview. or if you have lots of time, read both. And come back here and chat with me in the comments. What did you think of the Angelic people in the story? Are they helpful? a hindrance? abusive? are they a gift, or something to be freed from? 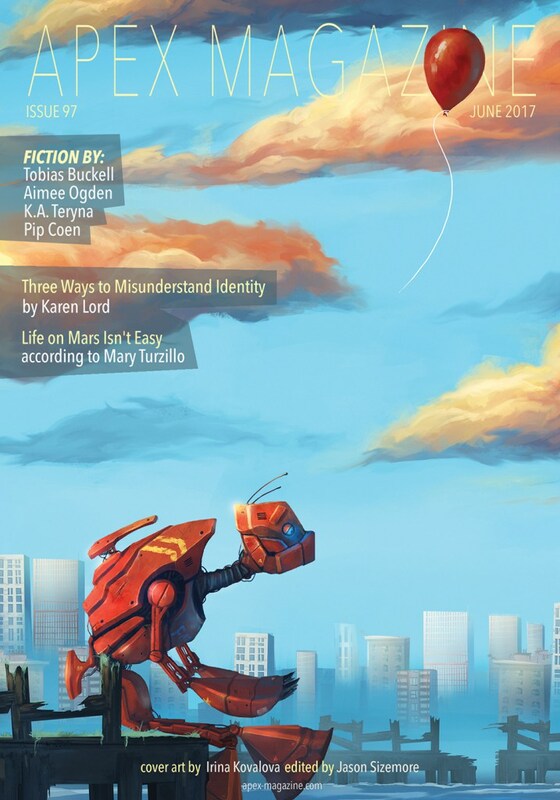 And speaking of short stories, I’ve been enjoying some fantastic short story podcasts from Clarkesworld recently, and hope to post reviews of them soon. 2 Responses to "The first week of June means new stuff at Apex Magazine!"